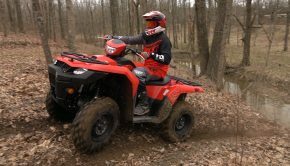 New updates and lower prices make one of the best sport ATVs even better. Yamaha offered more sport ATV models than their competitors every year since the late 1980s. It is said that “practice makes perfect.” Well, no other manufacturer has as much practice at designing and manufacturing sport ATVs as Yamaha. Since the launch of the 2006 Raptor 700, Yamaha has overhauled nearly their entire sport lineup, adding a number of new models. They introduced the Raptor 250 back in 2008, the YFZ450R in 2009, the Raptor 125 in 2011, and reintroduced the original YFZ450 at a new bargain price in 2012. 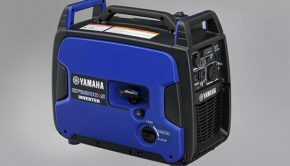 Just as we were thinking the 700 was due for some updates, Yamaha’s Georgia-based assembly lines were already busy pumping out updated 2013 models. The 2013s received a few subtle revisions and lower retail prices thanks, in part, to the introduction of a new base model 700. The most noticeable change to the updated Raptor is its styling. The front hood was redesigned with new air scoops. Its new look also has a greater resemblance to the other Raptor models. The front fenders were moved forward 50mm, or nearly two inches, providing more knee room. The area over the tank was also flattened out a bit. 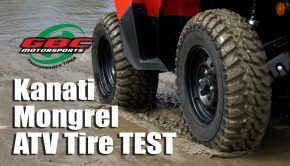 New Maxxis tires reduce weight. They are claimed to deliver lighter, more precise steering and greater traction at both ends, while maintaining the rear end’s willingness to slide. A dual piston rear brake caliper was added to improve braking power and feel. Yamaha shaved $300 off the price of the 700R for 2013, dropping it from $8,399 to $8,099. They accomplished this by assembling it in America and eliminating the digital display. Honestly, we’ve been wishing they would remove the display and drop the price for the past few years. 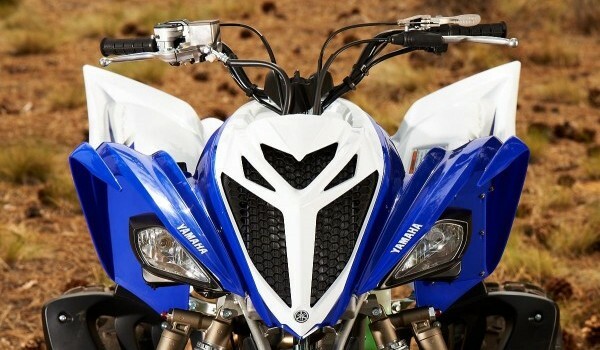 Yamaha’s targeted cost cutting on the base model Raptor 700 yield a $7,699 price tag. That’s $400 less than the 700R, $800 less than Honda’s 700XX, and only $600 more than Suzuki’s Z400. Many ATV enthusiasts spend extra money buying machines with fully adjustable suspension. Then, they go out and ride, never trying to fine-tune their shocks. Maybe you are one of them. If so, you will like the new Raptor 700. While the 700R has fully adjustable shocks at both ends, the 700 ditches the compression and rebound adjustments and front shocks’ reservoirs. While the shocks are simplified, they are preload adjustable, feature the same wheel travel as the R’s shocks, and mimic the 700R’s stock settings––a very good thing in our opinion. The adjustable front brake lever on the R was also swapped out for a non-adjustable one. These targeted, cost-cutting efforts yield a $7,699 price tag. That’s $400 less than the 700R, $800 less than Honda’s 700XX, and only $600 more than Suzuki’s Z400. The 700 comes in all white with two graphic kit options. If you want your next sport quad to stand apart in performance and appearance, Yamaha offers the Raptor 700R Special Edition. If you want your next sport quad to stand apart in performance and appearance, Yamaha offers the Raptor 700R Special Edition. It features a unique red and black color scheme, Special Edition graphics, plus aluminum GYTR heel guards and grab bar for $200 less than last year’s 700R SE at $8,799. Yamaha introduced the 2006 Raptor 700 to the media at the East Fort Rock OHV trail system located in Bend, Oregon. We were happy they took us back where it all started to try the 2013 version. Temperatures in the upper 30s kept us riding hard to stay warm, and light falling snow aided visibility by keeping dust down. The 700’s cockpit is very comfortable, offering enough room to move around. Feeling comfortable really aids in your ability to control the machine, becoming more of a benefit the longer you ride. The seat foam balances comfort and ease of movement; the controls are high quality; and everything was well within reach. In tight woods and wide-open sections, the 700 rips! The single cylinder 686cc, liquid-cooled, four-stroke features a four-valve, single overhead cam design. Needle bearing-equipped rocker arms reduce friction. A forged aluminum piston, with ceramic composite-coated aluminum cylinder reduces reciprocating weight, friction, and heat build up. Electric fuel injection delivers air and fuel to the cylinder through a 44mm throttle body. Power delivery is magical. It revs fast enough to thrill the most experienced rider, yet is smooth enough to ride all day. Power delivery is magical. It revs fast enough to thrill the most experienced rider, yet is smooth enough to ride all day. Its acceleration is on par with most 450s, but the motor and pilot don’t have to work as hard to go as fast, thanks to all the extra displacement. The big 700 runs strong and smooth in the bottom third of the RPMs, easily pulling tall gears without complaint. The transition from the bottom to the midrange is so smooth that the power never overwhelms you. In the midrange, the revs build surprisingly fast for a big single. After the broad usable midrange, power starts tapering off just before things get too scary. A responsible adult could learn to ride on this machine and never have the need for more power in the future. Like we said, it’s magic. Yamaha’s hybrid steel and aluminum chassis was created for more than weight savings. A wide ratio, five-speed transmission with reverse and manual clutch harnesses the engine’s power. Final drive to the rear wheels happens via an o-ring chain. Shifting is smooth, and clutch action is surprisingly light. First through third gear are perfectly spaced for tight, twisty trails. First gear is low enough to crawl around without abusing the clutch, and third is tall enough for tight switchback trails. There is a small gap between third and fourth gears as the top two gears widen out a bit allowing you to fly in wide-open spaces. Yamaha’s hybrid steel and aluminum chassis was created for more than weight savings. The cast aluminum fear frame section, sub frame, and cast aluminum swing arm reduce weight and add rigidity to the rear of the chassis. The steel front section allows some flex for a more forgiving ride than you might find on an all cast aluminum frame. Steel also dampens vibration better than aluminum, aiding the engine’s dual counterbalances in reducing vibration. At 45.5 inches in width with a wheelbase of 50.4 inches, the Raptor leaves you a little room to breath on 50-inch wide trails. At 45.5 inches in width with a wheelbase of 50.4 inches, the Raptor leaves you a little room to breath on 50-inch wide trails. The old Raptor 660 had a bad reputation for excessive body roll, mostly due to its too-soft stock suspension. The Raptor 700 handles more like a YFZ450 than the old 660. You can keep it flat in the turns with just a little rider input. Riders new to the Raptor 700 are usually surprised by its nimble its handling. The speed with which the 700 cuts fast switchbacks defies your expectation of what a big four-stroke should handle like. Steering is precise and responsive, but not overwhelmingly fast. It rails berms well and is, of course, a willing slider. The trade off for its willingness to turn is just a hint of nervousness when pinned in fifth gear. Where we rode in Oregon, the 700R’s stock suspension settings were pretty spot on–– good news for potential 700 owners. A-arms interchangeable with the razor sharp handling YFZ450 contribute to 700’s agility. Piggyback equipped, preload, high and low speed compression, and rebound adjustable shocks are found at both ends. 9.1 inches of travel up front and 10.1 out back are impressive on paper and even more so on the trail. The ride is notably plusher over rocks, exposed roots, and chop than most 450s, yet the shocks never felt willowy. If you roll into a whoop section and the rear end gets a little unsettled, snap the throttle and the Raptor straightens right up. The few small jumps we encountered were no challenge for the Raptor’s excellent suspension. Where we rode in Oregon, the 700R’s stock suspension settings were pretty spot on–– good news for potential 700 owners. The 700R’s shocks offer enough adjustability that moto-minded free riders, duners, and woods guys should all be able to find a setting to suit them. We look to explore the suspension’s tune-ability more in the future. Dual piston caliper-equipped disc brakes at both ends work extremely well. They provide plenty of stopping power and are easy to modulate, offering excellent feel at the lever and pedal. How can something this fast be so easy to ride? It’s like new school four-stroke meets new school four-stroke with power and rev-ability, but delivered at an RPM that lets the rider work less and the motor live for years. You think it should handle like a buffalo, but it’s more like a jackrabbit. It can leap a tall building in a single bound and still float over potholes. Practice makes perfect. If you’re looking for the perfect sport ATV, there is, perhaps, none closer than the 2013 Yamaha Raptor 700R! Summary: Practice makes perfect. If you’re looking for the perfect sport ATV, there is, perhaps, none closer than the 2013 Yamaha Raptor 700R!